One John Wilkes was elected MP for Aylesbury in 1757. George III soon-to-be-crowned King, arranged for his friend the Earl of Bute to get the job of PM. Wilkes wasn’t too happy with that. He thought Bute was incompetent, and so when one supporter of Bute started a newsletter called The Briton, it was only eight days later that Wilkes started his own newsletter, called the North Briton in response. Wilkes wrote anonymously each week, but his 45th edition was too much for George III and Wilkes was charged with Libel for accusing the George of lying, and he was tossed in the Tower. He challenged the arrest and won (eventually). His speeches during the trial became famous and had people chanting “liberty and Wilkes” in the streets. Sadly troops fired on the protesters, killing seven, in the Massacre of St George’s Field. The cry of “45″ (from the 45th edition) became synonymous with freedom of speech. Wilkes fled at one point to France, but was imprisoned again. The North Briton was then published by William Bingley, who also ended up in goal, and spent two years there without trial. Risky practice, what, speaking your mind. Britain has a proud history of democracy, but true democracy is such a fragile construct. Wilkes was initially protected by his position in Parliament, but it didn’t last. Apparently he was also challenged to a duel which left him wounded, expelled from the House of Commons, and though he was re-elected three times, the result was overturned repeatedly by Parliament. So much for the choice of the people. Sheer persistence, and masses of protestors meant eventually Wilkes took his place, and went on to create legislation to stop the government from punishing people who wrote political commentary. Partly thanks to Wilkes, I can write without fear of being tossed in the Tower. But lest we forgot how fragile that freedom is, we ought revisit the struggle. Andrew Bolt may not face gaol, but he is not free to write his considered opinion either. The Irish voted against the EU so the referendum was rerun, but the British haven’t even had the chance to vote once yet, as apparently it’s beyond the United Kingdom’s elected reps to arrange one. The Australians voted against a Carbon Tax, and got one anyway. And just as it was 250 years ago, the tool of pillory keeps many people from speaking their mind. Political correctness being just another form of bullying opponents. Recently I was lucky enough to handle an original bound volume of these newsletters. The quote below comes from page 1 of the first. I’ve transcribed the first page here (errors are all mine). Click on the image to read the original. The Liberty of the press is the birth-right of a BRITON, and is justly esteemed the firmest bulwark of the liberties of this country. It has been the terror of all bad ministers; for their dark and dangerous designs, or their weakness, inability, and duplicity, have thus been detected and shewn to the public, generally in too strong and just colours for them long to bear up against the odium of mankind. Can we then be surprized that so various and infinite arts have been employed, at one time entirely to set aside, at another to take off the force, and blunt the edge, of this most sacred weapon, given for the defence of truth and liberty? A wicked and corrupt administration must naturally dread this appeal to the world; and will be for keeping all the means of information equally from the prince, parliament, and people. Every method will then be tried, and all arts put in practice, to check the spirit of knowledge and enquiry. Even the court of justice have in the most dangerous way, because under the sanction of law, been drawn in to second the dark views of an arbitrary ministry, and to stifle in the birth all infant virtue. From this motive, in former times, the King’s-bench has inflicted the most grievous punishments of fine, pillory, or imprisonment, or perhaps all three, on some who have stood forth the champions of their country, and whose writings have been the honour of their age and nation. Under the government of a STUART, which has been so fatal to ENGLAND, the most daring encroachments have been made on the favorite liberties of the people, and the freedom of the press has been openly violated. Even a License of the press has been appointed. Nothing but the vilest ministerial trash, and falsehoods fabricated by a wicked party, had then the sanction of this tool of power; nor of consequence could any production, breathing the spirit of liberty, have a chance of being ushered to the light. The imprimatur of the minister was scarcely ever given, but to compositions equally disgraceful to letters and humanity. I do not however recollect that any of these hirelings have ventured, as the BRITON of last Saturday has done, magnificently to display the royal arms at the head of their papers. Does this author mean to intimidate? Or is it to insinuate that this new paper comes forth, like the GAZETTE, by authority, and that he is fighting under the ministerial banner? All opposition therefore to him, according to this idea, is to be considered as an indignity offered to the administration and an affront to the higher powers, who may be supposed to protect, perhaps to pay him. This is surely too stale a trick now to pass. I rather think the royal arms are prostituted by a mercenary scribbler…. Hey Anthony, may be you can help Jo here… If not ‘tyrants’, what do you call people who publish the contact details of their critics? I thought that worms live in holes in the ground. Why would Anthony bother publishing that? Coming from a splendidly foul-mouthed family, I could suggest any number of words for such people. And Jo, as a member of a splendidly foul-mouther nation, will I am sure have many phrases to hand. what do you call people who publish the contact details of their critics? - President John F. Kennedy, Waldorf-Astoria Hotel, New York City, April 27, 1961. People who complain endlessly about supposed Ad Hominem attacks being made against them and then publish the contact details of their critics are quite literally unbelievable hypocrites. Let me help you, (since you do not appear to understand the meaning of logic). Although ad hominem translates literally as against the man or at the man I can understand your confusion. It has nothing to do with actions involving the physical attack against a person or the committing of an act that is morally or ethically questionable. An ad hominem fallacy is an attack against the person rather than their argument. By the way, I clicked on the link to your page. So you have an MA degree in environmental politics? It amazes me that such a well-educated man could make such an ignorant statement as you did at 1.1.2.1. It is precisely because Martin has an MA in environmental politics that such an ignorant statement is made. Unfortunately, Martin believes because he has been educated that somehow he is anything other than a trained parrot, and his opinions are his own. I’ve got news for you Martin, regurgitating verbatim what you were taught does not make you intelligent, recycling the viewpoints of the opinion makers masquerading as learned professors of philosophy or enviro-science doesn’t make you an independent thinker. No matter what you may believe about CAGW, Anthony Watts has been nothing but consistent, polite and considered in his approach to the debate. He has, however, been relentlessly vilified by ignorant people wishing to shut down debate, when Anthony has an inalienable and incontrovertible right to hold that opinion and express it to its fullest extent. Do you deny him that right to free speech, Martin? data, and deconstructed a false paradigm and shoddy papers for all to see. Even assuming AGW were a reality (CAGW has been falsified! ), the fault in someone like Anthony pointing out their failings lies ENTIRELY with the hopelessly incompetent scientists pushing the alarmists barrow. But rather than look in the mirror at their own statistical and methodological mistakes, they seek to vilify their critics, shoot the messenger and generally avoid addressing their own deficiencies of logic and weaknesses of their argument. Since you have an MA in Environmental Politics, perhaps you can explain the conundrum that surrounds Kevin Trenberths reversal of the Scientific Results provided by Chris Landsea within the UN IPCC process leading up to AR4. From the link above, to quote Chris Landsea, my bold for emphasis. It is certainly true that “individual scientists can do what they wish in their own rights”, as one of the folks in the IPCC leadership suggested. Differing conclusions and robust debates are certainly crucial to progress in climate science. However, this case is not an honest scientific discussion conducted at a meeting of climate researchers. Instead, a scientist with an important role in the IPCC represented himself as a Lead Author for the IPCC has used that position to promulgate to the media and general public his own opinion that the busy 2004 hurricane season was caused by global warming, which is in direct opposition to research written in the field and is counter to conclusions in the TAR. This becomes problematic when I am then asked to provide the draft about observed hurricane activity variations for the AR4 with, ironically, Dr. Trenberth as the Lead Author for this chapter. Because of Dr. Trenberth’s pronouncements, the IPCC process on our assessment of these crucial extreme events in our climate system has been subverted and compromised, its neutrality lost. Do you think that the reversal of scientific results is the right thing to do when authoritative voices of the Catastrophic Anthropogenic Global Warming community present to the Media? Has the Catastrophic Anthropogenic Global Warming community harmed it’s credibility by supporting (their has been no internal sanction of Kevin Trenberth) the communication methods (Results Reversal) displayed by Kevin Trenberth? Do you find it an appropriate strategy for the Catastrophic Anthropogenic Global Warming community to continue Kevin Trenberths method to claim a link between current weather extremes and CAGW? It is now obvious in hindsight that you were attempting to communicate your accusations of ad hominem tactics and hypocrisy without actually typing or implying either of those phrases. My mental telepathy module has been out at the cybernetics workshop since last week for its regular 6000 meme overhaul, which was long overdue. Sorry it was not back in working order again in time for your bleating pot shot. I would not suffer such disconnects in meaning if I had only seen fit to join the CAGW sheeple and be united with Gaia as one hive mind. There’s no excuse for straight-up verbal abuse, but contact details could be used for so much more. Climate charlatans rely on co-opted institutional protection and dislike the idea that they ought to be able to individually withstand rational and evidenced arguments if their position is indeed true. Here is your chance to stay in the kitchen. 1b) Which evidence shows that any marine species critical to the human food chain is incapable of surviving a -0.15 pH drop in sea water? 2b.) How did the global warming rate of 1912 to 1942 equal the global warming rate of 1975 to 2005 before the majority of modern deforestation had occurred and before the majority of industrial CO2 has been emitted? 3d.) 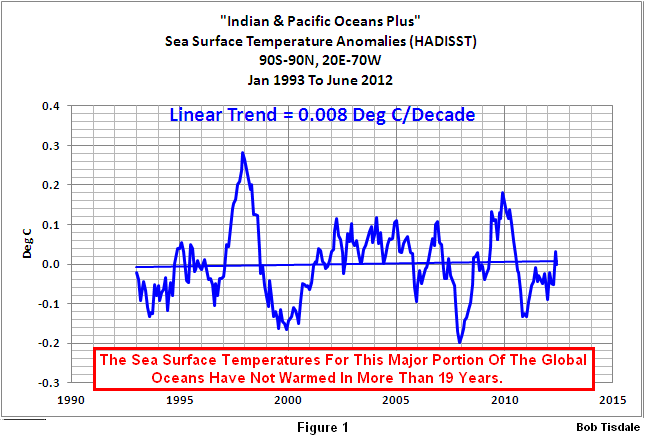 If Arctic sea ice melt is so worrisome because the sea exposed to more sunlight acts as positive feedback for ocean warming caused by GHGs, why should we worry when the two largest oceans, the Indian and Pacific, have not warmed in 20 years? 4a.) Where is the IPCC-endorsed physical radiative mechanism to explain why there will be 2 degrees of warming from a doubling of CO2 in spite of there being no significant global warming in either land temperature or OHC measurements for 15 years during a time of record CO2 emissions? 4b.) Where is there a global circulation model which can closely hindcast the previous 50 years of global temperatures and also forecasts more than 0.3 degrees per decade from now until 2050 in a business-as-usual scenario? You wouldn’t deny natural climate change would you? No pressure. Your being really tough on Martin! Mind you – it could be argued that CAGW is not even science, as it has poorly defined, and hard to find falsification criteria. Of course, Martin, with his MA in Environmental Politics will have at his fingertips, the clearly defined, empirically measurable, falsification criteria, which if they were to occur, would promptly disprove the central hypothesis that human emissions of CO2 and other GHGs will cause catastrophic global warming, and would cause Martin to declare the central hypothesis to, indeed, be false. Of course, Martin will be the first to affirm that the absence of such clearly defined and commonly stated criteria from any hypothesis, renders that hypothesis outside the boundaries of science, and he will no doubt be ready to articulate a powerful defense that the CAGW hypothesis is indeed science – and not a pseudoscience – by stating the falsification criteria. Well Tony, time again to bite the bullet and make a comment on the Science, (or ask a question about it anyway) and again show up my lack of knowledge. This so called concerning aspect of Melting Arctic ice has always puzzled me. So, what really is the problem if all that sea ice does melt? I’m willing to bet that most people actually do think it will lead to (catastrophic) sea level rises, but is the actual problem that, (as Andrew somewhat facetiously suggests might be the thinking that Warmists would like us to believe) it might lead to (overall) Ocean warming? Whatever you think Trenberth did, AR4 has proven to be woefully optimistic. I prefer to deal with the real world; and in the real world the positive feedback mechanisms AR4 did not include are establishing themselves faster than even those whose opinions were struck from AR4 thought possible. The Greenhouse Effect is not a hypothesis; and seeking to dismiss the inevitability of the enhanced greenhouse effect by using labels such as CAGW may make you feel better; but it does not change the nature of reality. You wouldn’t deny that climate change can be artificial too, would you? The only thing that is vacuous is your reply, or lack of it, to particularly Andrew’s questions. How can AR4 have proven to be “woefully optimistic”, when global temperatures have trended below Scenario C levels (when CO2 emissions have Increased above business as usual levels- ie Scenario A levels) is a triumph of illogic over observations. Additionally, CAGW is alarmists own terminology not some derogatory label given by skeptics, so that is a pretty lame attempt to rewrite history there, Martin. You still haven’t directly responded re Anthony Watts’ right to free speech. Like most alarmists you don’t respond directly to a straight question with a straight answer, so why would you think we would perceive you as anything other than one of the endless series of mindless acolytes who chant from the IPCC hymn book, while cherry picking from the experts they wish to believe, and simultaneously ignoring any experts that contradict their beliefs? You don’t bring anything substantive to the table, Martin, remembering that the onus of proof lies squarely with you. You don’t deny that climate changes naturally, do you? You have a strange meaning for the word vacuous. I thought that both (a) the evidence that I presented, and (b) the questions asked were direct, specific and charged with content. How would you define “vacuous”. Might I suggest that you are unable or unwilling to directly answer my questions, and that you have labelled them as “vacuous” simply as a rhetorical tactic to avoid engagement with them. The questions that I raise about Trenberth go directly to methodology. That is the content of the questions – I question the methodology. What you seem to be unable to engage with is that the methodology underpinning your ideological position is flawed. You also do not answer my questions, you ignore them, and then go off topic, and proceed to make assertions of positive feedbacks without any evidence. Might I make some observations. (b) Given your demonstrated incapacity to identify falsehoods, and disavow fraudulent material, why should I or anyone else give what you assert any credibility? Does the phrase “Fruit from a Poisoned Tree” mean anything to you? (c) Are you able to offer a single accepted scientific peer reviewed paper that deals with physical evidence (not computer models) that can demonstrate that the Climate System is subject to a NET POSITIVE FEEDBACK to increased concentrations of CO2 and other GHGs. I didn’t mention the Greenhouse Effect, nor did I deny it’s existence. Please stop projecting your misconceptions onto me. Let me straighten this out for you. (a) The Climate Changes – this is a fact. (b) The Climate has a history of natural variation over the the duration of life on this planet within a set of boundaries conducive to life that has lasted in excess of 600 million years. (c) Prior to the last 40 or so years, it was the generally accepted scientific Hypothesis that climate varied in accordance with natural forces, such as (but not limited too) changes in the Earth’s orbit and variation in Solar output, etc. (d) In recent times, the alternative “Hypothesis” that climate change is now primarily driven by human emissions of CO2 and other GHGs has been proposed. (e) The problem for the new Hypothesis is that there is no compelling physical evidence that demonstrates that the climate is varying iaw the human emissions of CO2 and other GHGs – in fact, the available physical evidence demonstrates that human influence on the climate is trivial. You have a couple of options. (a) continue to hang around and spout off, and carpet bomb the post with what amounts to spam, or (b) actually make the effort to engage in debate, and have the intellectual and moral courage to question your assumptions and provide measured, empirical evidence from reliable, calibrated instruments to back up your assertions. Winston, Winston, Winston – Are you really still going down the up escalator? Cyclical solar activity (variation in total solar irradiance [TSI], sunspots, or anything else) cannot explain the ongoing warming of the last 150 years. However, it can (along with consideration of the cooling effects of other industrial pollutants, volcanic eruptions, etc) explain why the warming that has occurred – and is occurring – has not been consistent. – the fact that more heat/drought records are being broken than cold/wet ones. This you quite simply do not have, which is why you resort to ad hominem attacks and hypocrisy. Ill informed alarmist comment based on other ill informed “science” should be avoided at all costs. The idea that Global Warming or Climate Change is man made is laughable when considered from a true scientific position and the widespread belief in this looming catastrophe is evidence, not of scientific discovery, but of the success of political scheming and avarice. The Politics of sustainability would have us believe that the Earth’s weather has always been stable and predictable but that is not the case. In just one area, sea levels, it may surprise many who have been mislead by the Global Warming alarmist movement to know that 18,000 years ago the Earth’s oceans were 120 metres lower than now. Locally this places the shoreline about 19 kilometres off Newcastle. During the big melt after the last ice age, the seas rose 120 metres to approximately their present level and have remained there for the last 5,000 years with occasional fluctuations of a metre or so. Many people are rightly concerned about pollution of the environment and I am wholeheartedly in favour or clamping down on dangerous chemical pollution by companies that have no concern for our future. In this area Governments are strangely very lax and the focus on harmless Carbon Dioxide seems to be a convenient way of distracting from the real pollution issues. People could give some thought to the fact that they are being mislead over so called “Carbon Pollution”. If nothing else besides the billions of dollars thrown at the “problem” it is a great vote catcher. Martin, as a geologist you would have to be aware of the truth of the outline above regarding sea levels and yet you would have us swallow the Warmer line that the oceans have been absolutely stable until humanity started to infest the planet’s surface and burning things to make CO2. As a scientist I resent being categorised by MA’s in Pseudo-Psycholo-Politics as being “In Denial” about man made climate change and saddened that science has become associated with the comfort of group think rather than the strain of individual effort and testing. The reason I am not prepared to discuss flaws in the scientific methodology of Trenberth (or anyone else) is that they are rapidly becoming irrelevant (i.e. being overtaken by events). These matters have been repeatedly investigated; and the scientists have been repeatedly exonerated. Continuing to insist otherwise is to admit you are a conspiracy theorist. You need to stop looking for evidence of malpractice and start engaging with reality: There is simply no evidence for a left-wing conspiracy to over-tax and over-regulate people (so as to make everyone poorer). Whereas, there is a great deal of evidence for a right-wing conspiracy to under-tax and under-regulate industry (so as to make a few people richer). Your conspiracy is an illusion; whereas mine is a historical fact. You seem to have a well developed capacity to imitate others as exhibited in your reply to Winston. IT IS NOT SCIENCE; it is copying. Can you pick the difference? Scientists think for themselves. 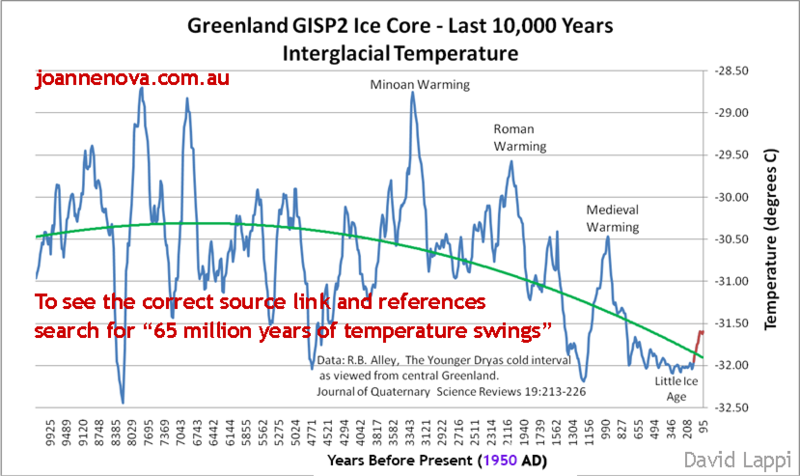 Just to illustrate my point Martin you seem to have provided an inbuilt contradiction in your comment about “thawing permafrost”. Doesn’t that mean that there must have been a period, long ago when the area being ” thawed” was so warm that the the vegetation now being exposed in the tundra was able to grow? Invites the question: How did it get there? Answer: Either Algore planted it there or it grew during a period of Warmth long ago. I’m amazed that there even is such a nonsense degree as Environmental Politics. That’s the explanation for Martin’s problem I think. The train of higher education has derailed. Underwater basket weaving would be more useful. Martin Lack is a guy who needs a useful job. when global temperatures have trended below Scenario C levels (when CO2 emissions have Increased above business as usual levels- ie Scenario A levels) is a triumph of illogic over observations. Martin – you did not address Winston’s statement. It has been obvious that temperatures have been more or less flat over the last 14 years, while CO2 concentrations have continued to rise. How long does this have to occur before the hypothesis that CO2 concentration is an important driver of global warming is falsified? Your assuming that the warming of the last 150 years is outside the boundaries of natural variation, and therefore requires another explanation, and yet you have no physical evidence that the warming that has occurred as we have left the Little Ice Age is unusual. Also how on Earth (no pun intended) do you get man made global warming in the mid 1800s during the nascent phases of the industrial revolution? Here is a link to assist you to understand the scope of natural climate variation over the last 1000 years. No physical evidence provided – do you actually have any, or are you relying on models without predictive skill? This is why it is not up to me to prove the validity of the scientific consensus. You have not overturned the original hypothesis that climate changes in accordance with natural variation. First you must show that this hypothesis “natural variation” does not hold, before you can argue for a replacement. You have not done that – please go back to square one. You can’t just say “my new Hypothesis is true, you must prove it false.” You must first provide physical evidence that current climate is outside the boundaries of natural variation before you can go any further, and since you have not done that – you can go no further. I could find no hypocrisy in Winstons comments above, perhaps you fail to understand what hypocrisy is? However, the “mindless acolytes who chant from the IPCC hymn book” does not apply to you – you ignore the science from the UN IPCC, and describe it as “woefully optimistic.”. Apart from that caveat, there is nothing in Winston’s comment that is not an apt observation. You’re really good at telling your neighbor he has a speck in his eye while you have rock in yours. Please, the debate isn’t about conspiracies. It’s about facts. Those evil right-wing conspirators are not working to squelch free speech. Your side of the debate is doing that. And that is a fact, pure and simple with no wiggle room for argument. The illusion is yours. Your historical fact is only fact if historical is spelled h-y-s-t-e-r-i-c-a-l. The 2nd Law of Thermodynamics is an excellent example of a scientific concept. It is in principle falsifiable, while I have enormous confidence in the 2nd law, if (and only if) someone was able to demonstrate a perpetual motion machine – it would be falsified. With that example of falsifiability in mind. Could you please state what the specific, measurable, empirical events are that qualify as falsification criteria for the hypothesis that increasing CO2 concentrations in the Atmosphere are going to cause catastrophic global warming. I am not claiming that you have an agenda. Everyone has an ideology (?) that’s not the issue. What I am claiming is that the methodology that you are using to establish your ideological position with specific reference to CAGW is incompetent to determine what the actual facts are. The reason I am not prepared to discuss flaws in the scientific methodology of Trenberth (or anyone else) is that they are rapidly becoming irrelevant (i.e. being overtaken by events). The methods by which the climate science artefacts are generated that you are so concerned about are at the core of what matters. Nature does not give up her secrets to the poorly prepared, if you want to know what the facts are, then your methods must be rigorous, detailed, rational, empirical, transparent and repeatable – these elements are missing from the methodological canon of the CAGW climate science community. These matters have been repeatedly investigated; and the scientists have been repeatedly exonerated. Continuing to insist otherwise is to admit you are a conspiracy theorist. When was Kevin Trenberth questioned or sanctioned? Evidence please? I don’t believe in conspiracies in CAGW. Occams Razor suggests that incompetence, irrationality, greed, intellectual laziness, and rampant unchecked confirmation bias are the far more likely root causes of the generation and longevity of this particular meme. How do you know what reality is, without a rigorous method of inquiry? Malpractice goes to method. There is simply no evidence for a left-wing conspiracy to over-tax and over-regulate people (so as to make everyone poorer). I couldn’t agree more. There is no such conspiracy – conspiracies are secret, and there is no secret that left wing politicians advocate taxes and regulations. In all honesty – your definition of what constitutes “over-” is not clear. Could you please quantify that? Whereas, there is a great deal of evidence for a right-wing conspiracy to under-tax and under-regulate industry (so as to make a few people richer). The left – right political distinction is weakly grounded and superficial. The superior dimensioning of the political arena is in terms of the concentration or dispersal of social authority, and the capacity to legally coerce behaviour. So the conspiracies that you believe in are true… just not any that you disagree with… and you know this – how? nothing left they borrow to leave a parting “gift” to future generations. Global Warming is just one of many subterfuges used by Big Government to transfer funds. Have you not heard of legislative and regulatory cooption? It is a feature of established, large corporations to buy political, legislative and regulatory influence. This is not controversial, it is a standard strategy and results in monopoly control of markets that disadvantage new players and entrench the incumbents. Your simplistic view of more regulation = good, less regulation = bad is just that – simplistic. The aim of an entrenched, incumbent player in the market is to co-opt the regulatory power of Government to enforce the market to continue to buy the goods and services that the player offers at a price favorable to the player. The operation of co-option strategies result in regulations that are favorable to the player, not to “more” or “less” regulation. The operation of co-option strategies is not political. Everyone who is a player in the marketplace attempts to gain control of the monopoly of legal coercive force that governments possess. Your assumption that the left-right political distinction is both useful, and meaningful is false – you need to question it. Ease up guys, without AGW, Martin’s MA in environmental politics would be worthless. Jo, I think you’ll find it’s “gaol” not “goal”. Gaol was the original word for jail, the new spelling probably came back from the colonies where there were great efforts to spell words how they were said. “Gaol” went out of fashion as a spelling for “jail” in the uk in the 1960s. Hey Jo!. Was that greengrocer’s apostrophe intentional? So, was that an own gaol? It’s happening here too! Unless there’s a big change in the political winds I think the First Amendment is in for some rough going. Freedom is indeed a fragile thing. Stephen Conman the Oztrian Minister for Propaganda announced yesterday that he has unfettered control over the press. Do you have a link to that bb? It’s ingenious, when you have unfettered legal power and absolutely no idea how to wield it productively what better use of your thoughts than hilarious quips about humiliating those under the unfettered legal power you wield. It entertains while it oppresses. What an arrogant and ignorant little socialist he is. “Arrogant and ignorant little socialist” is a pleonasm. Conroy would most probably take that is a compliment! I believe him to be a teeny weeny, tiny, little man who is dishonest, immoral, improper, unethical, unjust and unrighteous. The views expressed above are mine, they do not necessarily reflect the thoughts of this blog or our host. “Arrogant and ignorant little socialists” is not a pleonasm. Arrogant and ignorant are both adjectives with different meanings. A pleonasm requires redundancy. Perhaps her statement was an attempt at humor? Terrific to see ya back Jo. Pedantic point: KGIII did not come to the throne until 1760. His political machinations may well have taken place after that year but the article’s wording does leave an inaccurate impression. Jo, you’ve certainly come back with an almighty bang! Last sentence: (…) too stale a trick (…) (?). “too” is hard to explain but it is not “at” or “a” as in French. * a really stale trick. It’s an unusual word order in English and is not consistent with the rest of English. As you would be aware, English has been cobbled together from French and German over the centuries and is internally inconsistent in dozens of rules, even at the best of times. [that is] too stale a trick [to pass]. [that is] a trick too stale [to pass]. Your alarm at this Old English is a bit like climate alarm: We are told this event is UNPRECEDENTED and WORSE THAN ORIGINALLY THOUGHT, but a bit of careful analysis with respect to history shows it not to be so. Since the Royal Arms were used by the BRITON newsletter to pretend any opposition to their opinion was worse than was really true, you could even say…. Wilkes had just finished writing about BRITON’s stale trick to hide the benign. Great to see you back Jo. from history will be forced to relive it”. Don’t know who originally said it but they were right. and in the final para: “Recently I was lucky enough recently” – drop one “recently”. otherwise, we need to insist on our right to express our opinions, organise against the govt’s draconian data retention proposal and new media regulations in the wake of the finkelstein and convergence reviews. thanx jo for providing a platform. Look no further than the recent appearance of Anthony Watts on PBS for an example of the jackboot brigade. !8,000 people signed a petition to shut down any opinions except theirs. Donna Laframboise has a piece titled “The Anti-Free-Speech Brigade” about this. Yes, but how many of those signatures are even valid? Even if every last one of them is valid, they’re still a fair way behind the 31000+ actual qualified scientists, working in climate-related fields, who signed the Petition Project a few years ago. Plus who knows how many who didn’t, and all in the US just like the howling mob of anti-free-speechers. Take heart! Great to see your site back up, Jo. Immediately investigate the NewsHour segment featuring climate change denier and conspiracy theorist Anthony Watts for violations of PBS standards on accuracy, integrity, and transparency, and recommend corrective action to ensure that such reporting never again occurs on PBS. Donna Laframboise points out it is an incorrect statement. Watts is neither a denier of climate changing, nor is he a conspiracy theorist. Like with many groups throughout history, those who demand censorship in the name of freedom, accuracy, integrity, and transparency are by those who fall down most on such measures. The Irish patriot, Patrick Pearse, who was shot in the aftermath of the 1916 Easter Rising, said an interesting thing with regard to oppression, before his execution by firing squad. The only way they can win, is if they can put an idea up against a wall and shoot it. Excellent article. It’s only in the colonies that anyone cares about Britain’s “proud history of democracy”. As a point of history, I believe New Zealand and Australia had universal suffrage (at least for whites) several decades before Britain. Not surprising thet the colonies preceded after independence. They didn’t suffer the direct burden of inertia. It might only be in the colonies that Britain’s “proud history of democracy” is being remembered, but this may be soon eradicated according to an article in the Australian. JOHN Howard has re-entered the culture wars, describing the Gillard government’s national school history curriculum as “unbalanced, lacking in priorities and quite bizarre”, and accusing it of marginalising the Judeo-Christian ethic and purging British history. John Howard is a wise man, the socialists’ agenda is always long term planning and in the case of education, rewriting our history and introducing indoctrination and left side of politics propaganda to school students. In late Elizabethan England there were clever London reporters who sent the same news-letters regularly to a number of customers, still writing them by hand although printing had indeed been invented long before. The reason these did not explode into a wider ‘printed’ readership was due to the fact that the printing of ‘domestic political news’ was totally prohibited in England; the ban was not lifted until the liquidation of the Star Chamber in the 1640′s. One could buy pamphlets on the latest apocalyptic prognostications, strange tidings of earthquakes, raining frogs and the like, but coverage of domestic government & politics was forbidden. The exception was news from abroad, and between the years 1589 to 1593 a series of news pamphlets were printed which covered the latest developments in France and the low countries, where the wars of religion were busy causing the implosion of the French state. These ‘news quartos’ sold like wildfire to a populace thirsty for news; offering their readers frightening current accounts of Henry of Navarre and his battle with the Catholic League, as well as offering us today a fascinating glimpse into the burgeoning market for printed material and the complexities of early journalistic writing. Although starvation was a common military tactic, printed non-fiction pamphlets describing such wholesale suffering was another matter entirely. Journalistic objectivity was notably absent in the news articles, and sensationalism was the order of the day; a palpable double standard existed between the reported ‘heroic deeds’ of the protestant Navarre -dripping with bravery and courage- and the deeds of the Catholics, where no horrific detail is spared in the telling. Some things never change, nor has it ever been otherwise! You give me hope for the future with what you said. When you have trouble it’s always easy to lose your objectivity about things. Yes, it ever has been so. Today I Learned: the word “trash” is not merely a recent Americanism. The people of the 1760s did not face any force as destructive as Predator drones, nor as insidious as surveillance and sanctions on our communications and monetary transactions. The powers of old European kings were trivial compared to powers taken for granted today – by both regulators and proles. The greater imbalance in power between the individual and the regulator today makes the democratic rule of law commensurately more important. We can take heart that the regulators would not be so concerned with silencing critics and sowing noisy misdirection if there was no chance a unified mob could effect change. Perhaps Jo ought to have a spare printing press in the shed on the off-chance the Internet gets switched off. Thanks to Labor you’ll get your State propaganda faster and cheaper with the NBN. And you’ll never know what you’re missing. Andrew, I used ‘trash’ in some of my plays, around 1600. The Bard is a climate skeptic!! Presumably when the Copenhagen Climate Conference was happening you knew… there was something rotten in Denmark? A very good article Jo. Thank you. For example Marcel Leroux on Wikipedia – as flagged up by http://chiefio.wordpress.com/2012/09/29/marcel-leroux-wikipedia/ certain parties would appear to be trying to remove https://en.wikipedia.org/wiki/Marcel_Leroux page (or at least edit him down to nothing). He was a man that publish a few papers criticizing the AGW theory and offered other explanations for climate events. Should he be removed? Plus ca change, plus c’est la meme chose indeed. We always have an “alleged crook” for a PM. There are no end of “allegators”, (not my word). Oggi’s snip doesn’t make it unreadable. I suspect many in Australia share your sentiment. It’s a sad commentary on the present state of humanity that so many of our leaders can be so aptly described by such terms as you so obviously intended. The silencing of dissent is the worst possible transgression against freedom. We have to keep fighting. This is a very timely piece. Now nearing the end of the Labor Government’s reign we need to tally up the damage and look to what we can do, and while this blog is primarily about climate change, it is appropriate to talk about the money because that is what climate change is about too. insanity not seen since the Whitlam years”. If you are one of the beneficiaries of this redistribution of our tax money to the “bruvvers” then you will be quite happy in this “lucky country” of ours. I wouldn’t mind holding up a Stop – Go sign for $100,000 a year, stress free. If you are one of the taxpayers not benefiting from bloated salaries “won” by the unions for very basic work in the construction industry or some of the other scams then you aren’t doing that well at all. You and your children now have a government borrowings debt of $6,000 per man woman and child in Australia that has supported this lavish disbursement of cash. Your contribution, in advance, has been appreciated. As to the solution while the other mob have always seemed to be better at keeping the till full there are still issues. As we know, Tony has not been too clear about how he perceives the Taxes, ETS’s and schemes attached to “Global Warming” but he does know that the public can be empowered to force change as witness the outcry over big Malcolm’s failed attempt to install Goldman Sachs as the Australian treasurer. This shows it can be done. It seems that the redistribution in this area, saving the Earth, is too much of a good thing to put aside so where do we go. Truth is, we have lost control of our Representatives and those of us here would like that to change. Bringing about that change is not going to be easy. We have lost control of our representatives because they have lost control of the regulating classes in the Public Service. The Public Service has now become so infiltrated with socialists and collectivists that it is now the Public’s Master and the elected representatives seem to be powerless to stop them. I believe that the only way to deal with this is to repeal all legislation enacted over the past twenty years and to then remove all senior public servants and all stall associated with administering that legislation. The public service at state and federal levels has grown faster than the population they serve, it is the Union Labor way to provide jobs for unionists and to ensure that they are partisan players who will do the government’s bidding and leak if there is a change of government. Who in their right mind would agree to pay for six lawn mowing contractors to do the job one contractor has been doing? That’s public service, primarily in administration areas of government. It should also be noted that public servants’ wages are paid by private sector taxpayers, the taxes paid by public servants out of their gross earnings is not new revenue for governments, it is money returned to the public purse. Public service is very important but over staffing is at the expense of all Australians, governments do not have money, they manage our money and borrow money in our name and we pay the interest and other costs. Actually I think it’s more like $9,800 per head. Based on the level of $227billion borrowings out of the permitted public borrowings limit of $240 billion, which wasn’t enough for Labor even though they claimed this year there would be a surplus. See the (very) small print in the budget. They wanted another $25 billion (just in case?). The difference is from the “off balance sheet” items, such as the National Broadband etc. Still it’s only (your) money. I think that Julia will be favourite for the title of “Australia’s worst PM” even though you (KK) might disagree, but in sporting parlance Wayne birdbrain is the only horse in the race for “Australia’s worst Treasurer”..
That was just an off the top of my head estimate and thanks for the more accurate figures. Also true I may be tempted to put Whitlam ahead of Jules but man it’s hard to pick it, they are both such strong contenders. As for Wayne he has done very well to get $227 billion plus the initial surplus that was left (was that $20 bill?) out to the places it was needed most and is no doubt a very popular bloke in some quarters. How can we not have them arrested for this? They sure are good at it. Does that mean we are all slaves now? Scary KK, Borrowing over $600 million a day of late, no wonder we are compared with Greece and Spain by some economists. Pain is on the way. This is what happened in the Whitlam reign. They ran out of lenders and went to Khemlani! A simple per capita split is incorrect. The debt can only be honestly paid back by productive work, and the number of people in Australia that are Net Value Producers (NVPs) who produce a surplus of value beyond their own consumption, is, I strongly suspect, less than 50% of the actual population, and with an aging demographic the proportion of NVPs will continue to shrink until the Baby Boomers, as a population cohort, are passed through our community. The dishonest pay back options are default and hyperinflation where the economy gets smashed (temporarily) and the creditors take a big loss. Glad to see you back, Jo. 1) Your rights and liberties are your birthright. They are not the gift of government, and government has no right to take them away. Government exists not to give us freedom but to protect our freedom. Bush with his Patriot Act and Obama with his, gosh, what can be said about his understanding of the US Constitution? He’s supposed to have studied and taught it, but it appears he was taught some something else as he has the wrong end of stick on the very basic principle premise. But if some in the US are having a very difficult time trying to get people see that their constitution is being trashed, and most don’t help by confusing the issue with their own personal beliefs extrapolated, how do you in Australia get back your due rights and liberties under Common Law? In Britain it’s also a struggle, Common Law is the still the only law of the land and police should know the difference between “law” which refers only to Common Law, and “statute law”, which are acts of parliament and so on, but they are being trained as “police officers”, henchman of the Corporation UK which is working to actively suppress Common Law. It wasn’t all plain sailing in the thousand years of so of establishing Common Law, but I think this is our biggest battle to date, to keep it from being hidden entirely. We really do need to get back to the basic premise, to make it so well known that statutes infringing on our rights wouldn’t get passed. There are ‘ancient rights and liberties’, ‘undoubted rights and liberties’, ‘the rights and liberties asserted and claimed’, and ‘the true, ancient and indubitable rights and liberties of the people of this kingdom’. Clearly the people knew these ancient rights and liberties so well they didn’t have to spell them out. “They” are beginning to notice the Free Men On the Land, lawfulrebellion and others. Check DMBM512750 from HMRC on how to deal with “obscure responses from customers”, which sends the front desk staff scurrying off to (redacted) internal offices when they receive anything more threatening than “Yes, Sir”. But you’re quite right. Your rights and liberties are your birthright. And that puts the fear of God in them, lest too many of us realise it. Obama has a very good understanding of the U.S. Constitution. He understands that he has to get rid of it to achieve his ultimate goal of nationalising the U.S. and aiding the rise of a global Govt. The real problem is that he just another useful idiot and, knowingly or not is aiding in the rise of a world caliphate. The most recent rumor(?) is an executive order that will impose SOPA like restrictions on information exchange and give the Govt. a strangle hold on freedom of speech. This will, undobtedly be attributed to a need to stop people from maligning Islam and Allah as in the ridiculous video that has been blamed for the attacks on us consulates world wide and the murder of our citizens in Libya. Obama is much as you said. However he’s really on a mission to cripple his country’s ability to “oppress” the rest of the world. He’s the last anti-colonialist. That’s his mission. All else is a side issue unless it fits into what he’s dedicated himself to do. Should you doubt his real motivation I recommend reading his book, DREAMS FROM MY FATHER, and then the book, THE ROOTS OF OBAMA’S RAGE by Dinesh D’Sousa. …intelligent by all the evidence, shrewd, determined and dedicated, as dedicated a fighter for what he wants as I’ve ever seen…and it’s all wasted in an utterly amoral man with no scruples whatsoever…a narcissist of monumental proportions…a shameless liar (provable)…a man without a clear vision for anything but carrying out his father’s failed crusade…a man faking his way through life and his presidency…an empty and failed human being…and probably the most dangerous man in the world. And he has the support of very powerful people. America does not know what’s just around the corner. Exactly as you said. Most think this is a democracy yet they don’t understand either democracy or republic. If they did they would prefer a republic and would guard what they have much more closely. But we’ve failed in many things and now we pay the price, not just in America but around the world. Tyrants have taken advantage of every open door. And it’s now nearly impossible to lock those doors again. Great to see you back up and running Joanne! I find it disappointing that so many ‘mainstreamers’ (people who are not leftists) refer to there being free speech in Australia, as this is most definitely not the case. 5. Then there is the ostracising of people who do not conform with the ‘party line’. Just look at how the government uses its funding to reward those who support its global warming alarmism and exclude those who do not. But there is another reason we don’t have freedom of speech, and this reason transcends all others: it is that while the Left actively censor us the Liberals are too cowardly to do anything about it. Howard had 11 years in which the roll back the Left’s social agenda, and he did next to nothing. Even though he had control of the Senate (something that is unlikely to happen again for a very long time) he did not use the opportunity to remove section 18C of the Racial Discrimination Act. And just look at how it is being used today as a tool of censorship – AS WE ALWAYS KNEW IT WOULD, BECAUSE THAT WAS THE REASON FOR IT IN THE FIRST PLACE. Which Liberal state governments have rolled back their vilification laws? NONE. The cause is lost. The Left have won. This country is ruined. Thank you Barry, for saving me the effort. My son started high school in the latter half of the Howard years. In his first year the “history” component of his social studies consisted of a 40 something page photocopied document. The first three pages were not about aboriginals. They covered “everything else”. The rest of the document was a diatribe against the “crimes of the filthy white invaders”. Five years later nothing had changed. WA has had a “conservative” government for a while now. Al Gore’s “An Inconvenient Truth” is still being shown as a “documentary” in schools there. Ditto for NSW, VIC and QLD which now all have “conservative” governments. Representative democracy in Australia ended when Menzies retired in 1966. Since then our parliaments have been full of pigs whose only aim in life is to keep their snouts firmly in the feed trough. It is said that one definition of insanity is doing the same thing over and over and expecting a different result. For nearly 5o years Australians have been electing alternating LIB/LAB/NAT governments and expecting things to change. Talk of the “right to free speech” or any other “right” for that matter, is meaningless for people who have no way of enforcing these supposed “rights”. There are only two ways for people to enforce their claim to these “rights”. The first is legal redress, which can only exist under a system of Rule By Law. The second is by Force Of Arms when Rule By Law is supplanted by Rule By Might. Rule By Law died in this country when the Ruling Class granted themselves the power of Retrospective Legislation, whereby at some point in the future something one did yesterday which was perfectly lawful at the time, can be nonetheless declared a crime. The opportunity to oppose Rule By Might with Force Of Arms was stripped from this country when the civilian population was disarmed. John Howard and the Liberals were responsible for both. We no longer live “under the rule of men truly great”. The pen (free speech) is no longer mightier than anything. And the other side have all the swords. “Free speech” is a worthless notion once you give up the ability to fight and retain it. One must be completely mindful of that reality before they can be qualified as “pro democracy”. So many leftists try and fail this test and therefore cannot be “pro democracy”. A man who has lost a Supreme Court challenge against Australia’s compulsory voting system says he plans to take his legal fight to the High Court. A full court of three Supreme Court judges has unanimously dismissed his appeal. “We are actually contesting the meaning of the word vote, which is a free choice. Mr Holmdahl has argued adults should have freedom to choose. “What is the difference by putting in a blank vote, as 730,000 people in the last federal election did … [and] not turning up at all? The result is exactly the same,” he said. “I do believe we are getting a bit like a totalitarian state here at the moment. Why shouldn’t we be treated as adult people and make a decision if we want to vote or not? Former Liberal senator Nick Minchin attended the Adelaide hearing to lend support to the legal challenge. “I’ve always said that compulsory voting is an infringement of the democratic rights of Australians, so I’m delighted this case was brought to court,” he said. “I’m sorry that the matter has been dismissed at this level, but I hope it will be taken to the High Court. In the past few days, the media reported that climate change threatens Valley crops. What is interesting about this is most Valley farmers don’t believe in climate change. Farmers are realists; but most Valley farmers reject (what I believe to be) global warming reality. Something in the Valley’s conservative mindset impels them to. Fry does not believe greenhouse gases are causing the greenhouse effect. Rather, he believes the Earth’s vast weather cycles bring changes naturally. It doesn’t change his mind that the U.S. Department of Agriculture has warned Valley farmers to prepare for climate change by finding warmer-weather crops. Nor does it persuade him that the overwhelming majority of scientists agree the Earth is warming. The state Department of Water Resources, for example, said spring runoff has declined 10 percent over the past 100 years; double that in recent years. Global warming denial would seem to set Valley agriculture up for a huge fall. Ag needs to be preparing for climate change by testing warmer-weather crops, finding new chemicals and devising new water policies. Of course, reasonable people can disagree; climate skeptics may be right. But I believe they are wrong, and more, that their wrongness says something about the Valley. Moreover, conservatism appeals to people who, by definition, resist change, Mooney writes. So conservative’s psychological and political leanings cause them to reject facts that, if accepted, would change the world in ways they see as deeply wrong. Our beliefs exist in a web, said Ray Rennard, associate professor of philosophy at University of the Pacific. Most beliefs exist in logical relation. “But the web is broad enough that there can be inconsistent beliefs,” Rennard said. When incompatible beliefs are brought to the fore, cognitive dissonance – holding conflicting opinions, beliefs or values – occurs, and must be resolved. Bias confirmation requires a “feedback mechanism,” someone or something that affirms a person’s bias. In this context it’s interesting to note that earlier in 2012, The Union of Concerned Scientists studied 40 Fox News segments on global warming. The scientists found 37 of the 40 segments – 93 percent – misleading. None of this is to discredit Valley farmers. On the contrary. They created a world-class farming region. They did so in part by being remarkably adaptive. Ultimately, I believe, they will accept the evidence – especially when it hits their pocketbook. Probably they will innovate in a way that sets the standard for the world. Perhaps all humans stumble along with thought processes inadequate to the complexity of the world. But the specific weaknesses define different groups. In the Valley, people hate inconvenient truth. I would back the farmers, they are out there every day checking. Fitzgerald’s use of the term Climate Change is a dead giveaway, he thinks it is going to warm up in the near future. From what I can see, and I bet those farmers are even better informed, the next 30 years will show cooling, not warming. Welcome back, Jo. Appropriate that yer thread is about freedom of speech,crucial ter the open society anathema to its enemies! That was a beautifully written piece from a thinking person centuries ago that just about sums up our government in a nut shell. The next question is they are doing identical stuff against free speech now they got over it then, but violent civil war is out is this time, so what the hell do we do about it, I’m convoyed out. Some few hundred thousand ordinary Australians camping on the lawns and blocking all access to parliament would most likely do it. Start the ball rolling and set a date Jo. Summer time is good so soon would be good, I’m up for it. Don’t forget John Milton’s Areopagitica in the 17th century as a milestone in advocacy for free speech either. Warning (not warming!) from England about the fragility of free speech, posted on the blog of a Canadian hero of this issue. The last resident in The Tower [of London] was Rudolph Hess. So perhaps us other “climate deniers” ought to button-our-lips, and be more cautious about making un-approved journeys in European air-space. Welcome back Jo! It is so good to hear your voice again! but we can hear you Lars. It is good to see you back in action again! I find it hard to believe that the majority of Australians would sit idly by while their basic civil rights were stripped from them. Doesn’t the Australian Constitution have a provision that guarantees freedom of speech? Forgive my ignorance but I am wondering if Australia possesses the American equivalent of the First Amendment to our Constitution? If not, I hope this attempt at blatant censorship culminates with a guarantee for all Australians of a right to free speech. Finkelstein strikes me as being a political Frankenstein. What a monster! Eddy, I think both our countries are experiencing the same malaise. Over your way there seems to be any number of statists who refer to your Constitution as a “living document”. What they mean by that is that everything in it is up for perpetual discussion until they achieve their objective – a socialist state. So, not much different here. Socialists just ignore what few protections exist in our Constitution knowing that the only redress is a hideously expensive battle in our High Court that few can afford to wage. Over your way there seems to be any number of statists who refer to your Constitution as a “living document”. They don’t even do that anymore. They just ignore it altogether. If it’s in the way, kick it aside and go on anyway. Jo, Google is no longer finding your site. I suggest you contact them and give them the new URL details. I can’t say whether they will act on this information. I also suggest you update your wikipedia page to have a clear link to your new site. People around the world are worrying about their carbon footprint. But what about their furry friends’ carbon pawprints?, Guy Pearse from the University of Queensland asks. 1 Oct: The Conversation: Guy Pearse: What about your carbon pawprint? btw jo, it’s true google isn’t showing your homepage url at top of their results, but instead shows various older pages. The site has been moved again overnight and some people may notice a much faster performance today (I am!). But it means that some people are struggling to get in (eg Tony Cox, who rang me) — there seems to be some problem with domain name transfers to various servers. Some are not yet serving up the latest address. Also we switched off the bots for the moment – the bandwidth graphs are suprisingly high despite the lower than normal traffic and even without bots. Probably the google search will sort itself out in a day. Thanks for your patience, and thanks, especially for all the skilled help and work of Andrew B and Ashley. Regarding some people having trouble getting in, when you first got the site up and running again,it was taking me two or three attempts to get in. Since earlier today that problem does not seem to happening for me anymore. Welcome back, Jo. Where’s Janus when you need him? Where’s Janus when you need him? Or Junius, of course. I hate computers. lots of trouble opening your site jo. took an hour to get this page up. comments are posting way off the time they were posted as well. Like other scam carbon credit investment companies, CCC has been a disaster for investors. For you, the result is particularly serious – you could lose your home. These firms entice investors with the tale that giant industries need permits to spew carbon into the atmosphere. They explain that through connections to forestry schemes or similar green projects, they have carbon credit certificates to sell. What they do not tell you is that there are two types of credit – certified and voluntary. Big businesses hold certified credits. No prizes for guessing that small investors are stuck with the almost pointless voluntary credits, and a tough time trying to turn them back into cash. And last April, I reported that CCC had attracted complaints from Visa, Aviva, Barclays and HSBC. CCC had used their logos without permission, suggesting they had invested in its carbon credits. The real problem is that carbon credits are a recent invention, not covered by investor protection laws. Anyone can call themselves a broker. There is no ombudsman, and definitely no compensation scheme. Perhaps our legislators could take time off from their busy schedule of saying sorry for past sins, and abusing police officers, and find time to plug this gap in the law. Or would this be a step too far? You may check every individual company listed over there – I haven’t done so but Gunderson claims that none of them is concerned with carbon reduction or alternative energy sources. In particular, none of the companies produces solar panels, wind turbines, or biofuels. Instead, what you find are mundane commercial real estate, biotech, and healthcare companies, aside from Amazon, Procter and Gamble, Colgate Palmolive, Polypore (whose stocks they doubled: production of membranes for batteries and filters), and others. I wonder whether during one of the future “climate reality days” that Gore organizes, he will reveal the reality of the climate’s absence in his investments. There is a decent book about John Wilkes, entitled “John Wilkes: the Scandalous Father of Civil Liberty”, by Arthur H. Cash. I’d say that it’s a heck of a lot better than its title, but a little bit less good, perhaps, than its subject really deserves. John Wilkes springs to mind all too often, now. When Cash wrote his book, it resonated in all sorts of ways in the Britain of Blair and (especially) of Brown. When the US Department of “Justice” goes after Gallup for accurately reporting opinion polls, we badly need a new Wilkes, who can be cloned in every English-speaking country. I can’t remember, without checking, how John Wilkes Booth was related to the great John Wilkes, but I’m pretty sure I know to which of the two the eco-fascists have the greater affinity. Just adding one thing… William Hogarth, possibly my favourite artist, surely the greatest visual polemicist who has ever existed (Alexander Pope and Juvenal in paint) was decidedly a defender of liberty, but he really loathed Wilkes – I don’t know why. We need a new Wilkes and we need a new Hogarth, but they need to be friends, this time. In 1975 a referendum was held on whether Britain should remain in the EU. I remeber it well because I was there at the time and active in trying to get out the “no” vote. The Irish voted against the Lisbon Treaty, it was re-run and manipulated to get a yes vote. The police took away ballot boxes and returned them doctored because obviously the people were too stupid to know what they voting for the first time.. I listened to the radio and heard Mr Hockey admit that interest rates under the Labor Government were lower than when he was a cabinet minister. He said it was no accident that Mr Swan had been named the World’s Best Treasurer. Mr Hockey went on to praise the Labor Government for getting interest rates down, saying it was an excellent outcome for mortgagees, businesses struggling with difficult trading conditions, and families struggling to pay the infrastructure dividends being ripped off them by Coalition state governments. He admitted Mr Swan would be a tough act to follow, particularly when the Coalition has a twice forward estimates budget black hole of $140 billion. He noted that the fact that he did not really talk with the Shadow Spokesperson for Finance, Mr Robb, was not helping the Coalition develope a coherent and comprehensive set of policies. He also expressed concern at Mr Abbott’s habit of casually adding billions of populist expenditure to the Coalition tally. He admitted that he despaired at Mr Joyce, saying that he was just a rural socialist populist who was quite happy to wreck the joint as long as the National’s clients could get some real snout into the trough. Mr Hockey admitted that he is amazed that the Labor Government is still determined to achieve a surplus saying that the Coalition would have smashed the Australian economy by recession-engendering cuts and slashes, just like the state Coaltion premiers are doing at the moment. •	The Marcel Leroux English page was deleted under the notability pretext. •	However, this was from the start an attack against his scientific opinion about Anthropogenic Global Warming as demonstrated by the bursting tirade about “global warming deniers” by William M. Connolley. We certainly put up a fight for all to see, exposing the deletionists true character in face of a genuine document and in doing so, question Wikipedia’s credibility on a now highly political subject, climate. What other subjects are similarly edited resulting in the obfuscation of information? •	I must point out that in helping create and defending the Marcel Leroux page, I never lowered myself to attack the Wikipedia pages of those I disagree with. I may not have plethora of quotes and medals on my personal page, but as the great Moliere pointed out, it is not the Professor of Good Manners that makes one’s character. •	4 years after his death, it is remarkable Professor Leroux scientific contribution still manages to annoy so much the ideologists that they are ready to become grave diggers to erase even the memory of this climatologist.